This a sweet tale of fairies no bigger then a butterfly that guard the forest deep in the land of Cambria . They have been in hiding for centuries from the humans that would use their magic . But one little fairy Raine is about to change all of that . When she meets Bryce a human her life becomes just a bit more complicated . Will she be able to keep her kingdom safe and follow her dream of loving Bryce . Or will she give up her true love to realize her destiny. The characters in this story are sweet , sometimes too sweet . 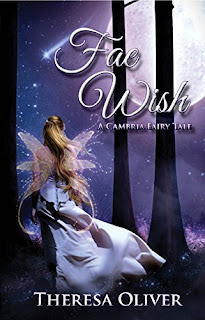 Raine is a brave fairy who just wants to bring the fairies out and fall in love . She kind of looses her way a bit but she realizes that she can be both a fairy and be in love with Bryce . She really grows as you read the story. Bryce is like her prince charming their to protect her and keep her safe . He sometimes comes off over sweet but you will love him anyway . They are a sweet couple and really work well together. This would be a book that my great niece would love . It is sweet and has fairies and love . The author takes us on a magical journey full of hope and love . There is one thing that kind of hand me a little hesitant to give it more stars . Was I gave me the feeling of another Disney movie the little mermaid but with fairies . Over all I really enjoyed the story and I am going to get a copy for my niece . So if you have a daughter that loves fairies this is the book for you . Add it to their winter reading list .